In southwestern Colorado, the Gunnison Basin stretches over 2.5 million acres of gorgeous montane sagebrush country. This Rocky Mountain watershed ranges from 7,000 to over 14,000 feet in elevation, and is spread across three counties. Three-quarters of the land is public, managed by the U.S. Forest Service (51%) and Bureau of Land Management (24%). The region's diverse landscape provides the natural resources that support its economic mainstays of livestock grazing, recreation and tourism. The clean water and abundant forage also support 350 species, including rare plants, elk, mule deer, and the threatened Gunnison sage-grouse. Wet meadows and other mesic habitats comprise just two percent of the arid American West. Yet these “emerald islands” sustain 80% of wildlife across sagebrush range as well as livestock during the summer and fall months when uplands dry out. Sage grouse hens and their broods rely on the high-protein food sources found in wet habitats as the chicks grow. In the Gunnison Basin, many riparian and meadows have been degraded by erosion and past land use activities, resulting in lowered water tables and deep gullies. Local landowners and community members are concerned that increased droughts and more intense precipitation and runoff events will further degrade these vital wet areas and lower soil water availability for agricultural operations. To prioritize where to restore degraded riparian areas and meadows in such a large landscape with limited funds, the Gunnison Climate Working Group first conducted a GIS analysis. The Nature Conservancy of Colorado evaluated the “greenness” of wet habitats across the basin using satellite imagery, digital elevation models, NDVI data, and cover of riparian/wetland vegetation. The locations of known sage grouse leks (breeding sites) were then included. This analysis pinpointed the most at-risk stream reaches that also had the best potential for responding well to restoration efforts. In addition, scientists with the Colorado Natural Heritage Program, BLM, and USFS have been monitoring the restoration treatments since the project's inception in 2012. Monitoring data at restored sites shows an average increase of 250% in wetland species cover in just five years, compared to 42% in untreated areas. The Sage Grouse Initiative’s science team also assessed the outcomes of recent mesic habitat restoration in the Gunnison Basin, finding an 24% increase in late summer greenness post-restoration after five years. Collectively, the monitoring data provides scientific evidence that these simple restoration structures are working, and also help share the success with other communities around the West that may be interested in applying similar techniques to repair meadows or streams. 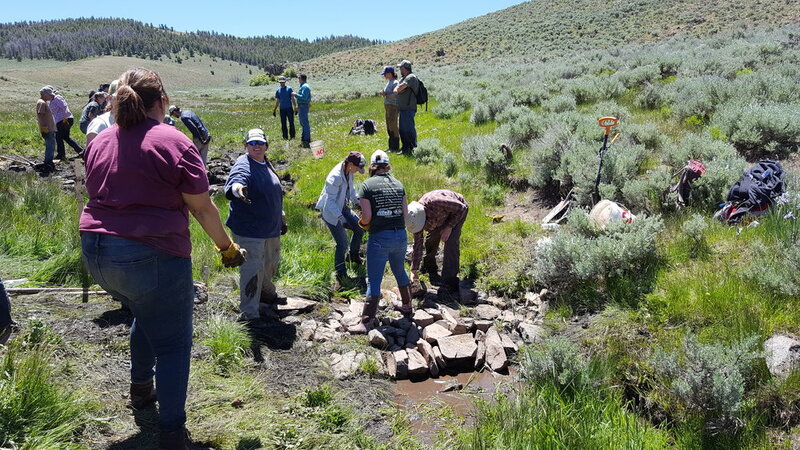 In 2012 the Gunnison Climate Working Group launched the Riparian and Wet Meadow Restoration and Resilience-Building Project to improve natural water storage and native plant communities, which in turn benefits working ranch lands and wildlife. This locally-led collaborative group—comprised of over a dozen partner agencies, non-profits, and landowners—aims to help the basin's rural communities become more resilient to droughts and floods. The goal of the project is to slow down and spread out the water that's already on the landscape, whether it's snowmelt, a creek, or a small trickle. To do this, the group's many partners are installing a variety of simple restoration structures (typically made of rocks, dirt, and tree trunks) that capture sediment, raise the water table, and reconnect streams to their floodplains. The structures increase and expand soil moisture over both space and time, which increases plant growth, benefiting livestock and wildlife. To get the most ecological bang for the buck, the Gunnison Climate Working Group designs watershed-scale projects. That means working across multiple public and private land ownership boundaries to install restoration structures. Typically, degraded streams and drainages require dozens of rock structures strategically located within a stream reach to reduce erosional issues and slow down the flow of water through the system. The structures are usually less than one foot in height, installed with help from volunteers, and custom-designed to fit each unique stream reach. These innovative and cost-effective conservation techniques have proven successful for increasing riparian and wet meadow habitat—this improves natural water storage, buffering communities from future threats like droughts or floods.